When everything is working properly 24v power goes to the two End of Line resistors on lines (1b) and (5a). 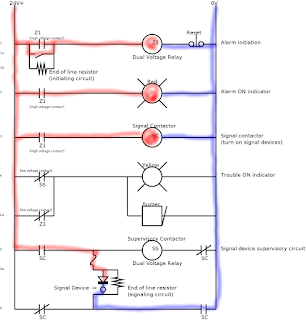 Voltage drops in the resistors then continues to flow through the Dual Voltage Relays* on lines (1) Z1 and (5) SS. 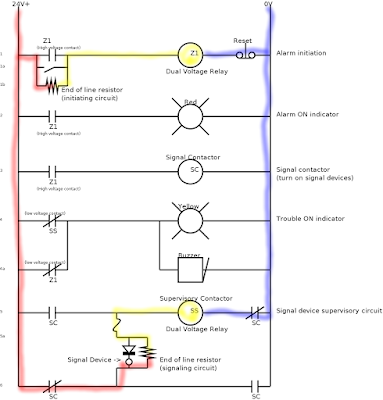 The Signal Device on line (5a) is not activated because the Diode is reversed. The low voltage contacts SS (line 4) and Z1 (line 4a) are opened because the low voltage coils are activated, this prevents the trouble light and buzzer from being activated. 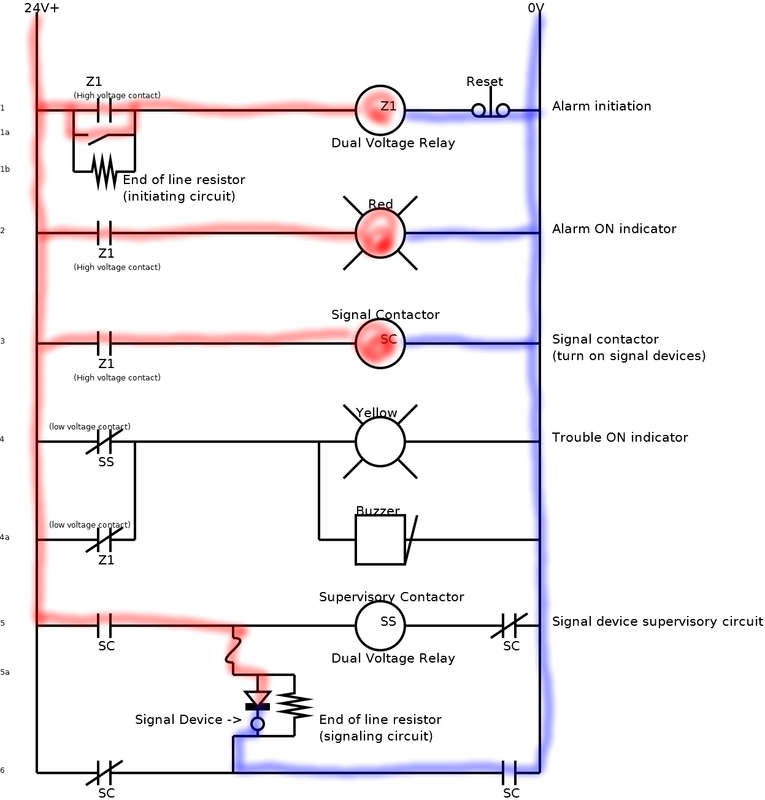 *Dual voltage relays have 2 sets of contacts, when low voltage goes to the coil it activates the low voltage contacts, when 24v goes to the coil it activates the high voltage contacts. When the alarm is triggered power goes through the switch on line (1a) which powers the high voltage coil of Z1. 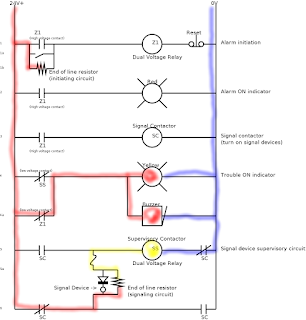 The High Voltage contacts Z1 on line (1), (2) and (3) close activating the red light on line (2) and the coil of relay SC on line (3). The normally closed contacts SC on lines (5) and (6) open and the normally open contacts SC on lines (5) and (6) close, this allows 24v power to flow through the Diode and Signal Device on line (5a) because the Diode is now connected forwards. 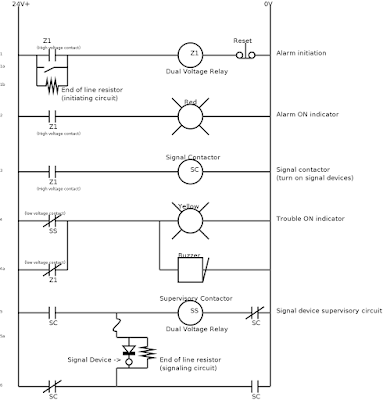 When the end of line resistor is missing or a wire is broken in the initiation (line 1b) or signal circuits (line 5a) the low voltage power does not make it to the coils Z1 (line 1) or SS (line 5). This makes the normally closed contacts SS (line 3) or Z1 (line 4) remain closed turning on the Yellow light and Buzzer. The first image shows a Trouble in the initiation circuit, the second image shows Trouble in the Signalling circuit. The next diagram shows the changes required to meet the problem specifications. Added lines (2) (2a) and (2B), these are a copy of the original initiating circuit and works the same way. Low voltage contacts Z2 are added on (8b) to activate the trouble circuit. High voltage contacts Z2 are added on (7a) to activate the signalling circuit. Added line (6) with High voltage contacts Z2 and Red light. Added line (3) and (3a) these lines are a latching circuit, when the button is pushed coil AS (line 3) is activated and contacts AS (line 3a) close, keeping the circuit on. 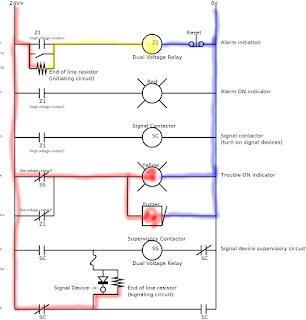 Added normally closed contacts AS (line 9a), when coil AS (line 3) is activated the contacts on (9a) open, stopping power from getting to the Signal Device. When the reset button (line 1) is pressed, power is stopped in the AS coil (line 3), this resets the Alarm Silence circuit. 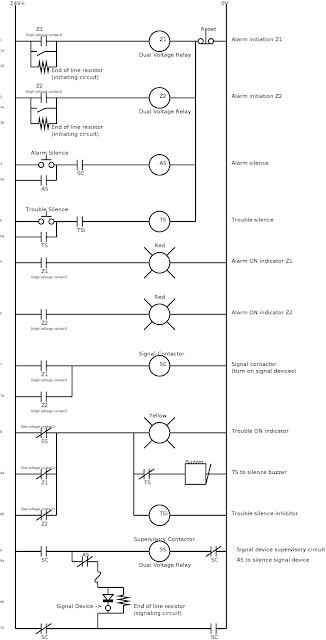 The SC contacts (line 3) prevent the Alarm Silence circuit from working if there is no active alarm. Added line (4) and (4a) these lines are a latching circuit, when the button is pushed coil TS (line 4) is activated and contacts TS (line 4a) close, keeping the circuit on. Added normally closed contacts TS (line 8a), when coil TS (line 4) is activated the contacts on (8a) open, stopping power from getting to the Trouble Buzzer. 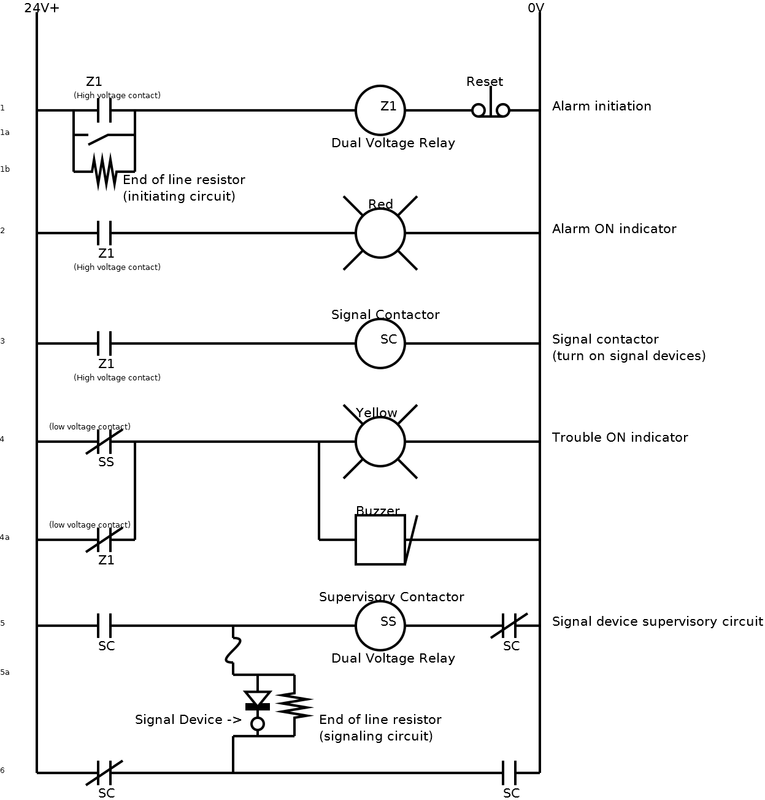 When the reset button (line 1) is pressed, power is stopped to the TS coil (line 4), this resets the Trouble Silence circuit. Added coil TSi (line 8b) to acts as a Trouble Silence inhibitor. This is used to prevent the Trouble Silence from working if there is no active Trouble. When the TSi contacts (line 4) are open the Trouble Silence circuit is prevented from working.